Archibald McIndoe standing and speaking. The top table guests are seated. 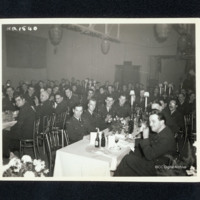 In the foreground are the backs of several airmen seated on one of the long tables. Captioned 'HQ1545' and on the reverse 'Archie'. 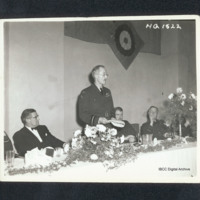 Wing Commander Ross Tilley standing and speaking, Archibald McIndoe and two others are seated at the top table. 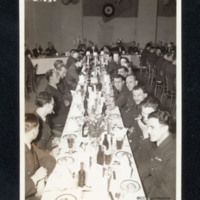 Captioned 'HQ1528' and on the reverse 'Ross Tilley RCAF'. 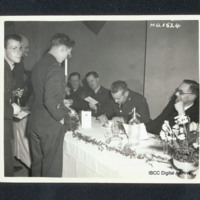 Four top table guests seated, Wing Commander Ross Tilley signing a menu. Three airmen standing, waiting. Captioned 'HQ1524'. 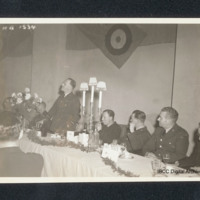 Sir Alec Coryton delivering a speech with Sir Charles Portal, Archibald McIndoe and Wing Commander Albert Ross Tilley seated at the top table. Captioned 'HQ1523' and on the reverse 'Mac Lord Portal'. 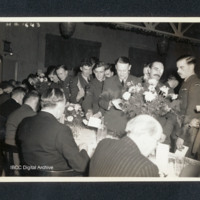 Eleven airmen standing round Wing Commander Ross Tilley whilst another signs a menu at the table. He is smoking. Some of the airmen show facial burn scars. 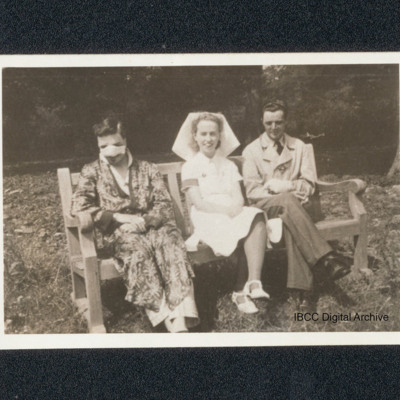 Captioned 'HQ1527', and on the reverse 'Ross Tilley RCAF patients'. 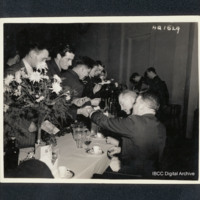 Group of standing airmen getting menus signed by four seated civilians. The civilian are at the top table at the formal dinner. 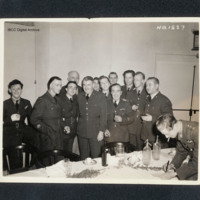 Captioned 'HQ1643', on the reverse 'Roy Hocrer RCAF'. Group of standing airmen around Sir Archibald McIndoe. He is signing his autograph for members of the group. Captioned 'HQ1544'. 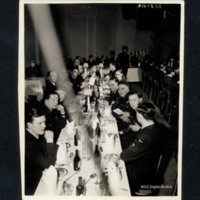 One long table of seated airmen with two further tables partly visible. 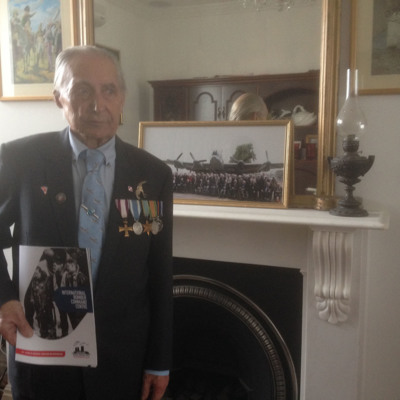 In the background the top table and on the wall a Royal Air Force ensign. Captioned 'HQ1538'. 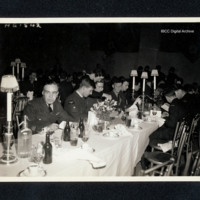 Group of airmen reading menus at formal dinner. Waitress taking down an order. One airman's face shows facial burn scars. Captioned 'HQ1542'. 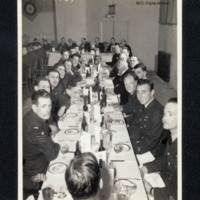 Long table of seated airmen, on the right is a second long table and in the background is the top table. Some of the airmen have facial burn scars. Captioned 'HQ1552'. 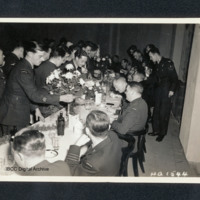 Group of airmen seated at long table. In the background is a second long table and the top table. Several airmen show facial burn scars. Captioned 'HQ1539'. 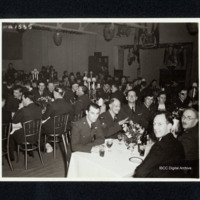 Three long tables of airmen seated at formal dinner. In the background various flags and decorations. Several airmen show facial burn scars. Captioned 'HQ1535'. On the reverse 'Towers Perkins Percy Jayes'.